Running numbers 1000 to 1029. 1946-47 (1020 - 1029) to lot number 358. As the 'Kings' were the final development of the 'Star' class, so the 'Counties' were the ultimate evolution of the 'Saint' locomotives within the 20 tons axle limit. It was said that F. W. Hawksworth, who designed the 'County' locomotives, intended the class to be an evolution of the 'Hall' class with 4 row superheaters. Instead, a new boiler was created, number 15, together with other new concepts for the Great Western including 6 feet 3 inch coupled wheel diameter, 280 pounds per square inch boiler pressure and a continuous splasher over the driving wheels. 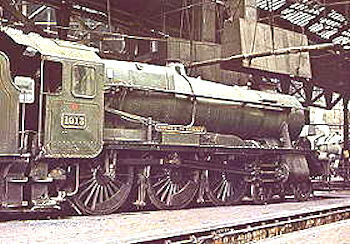 Initially the class would be numbered from 9900 but this was altered before assembly of the first locomotive. The power classification of the 'County' class was 6-MT, the G.W.R. power class was D and the route availability was RED. Commencing in 1956, the boiler pressure was reduced to 250 p.s.i due to worries of hammer blow damage to the track. A modified chimney and blastpipe was fitted to all members of the class between 1956 and 1959. No locomotives of the 'County' class were saved for preservation. Length 63 feet 0¼ inch Total Weight 125 tons 17 cwt.